We eat so many of them. For cream teas for special friends! 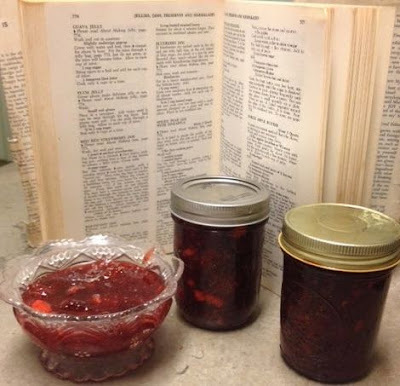 not a regular jar -- just that little bit of "breakfast jam"
My output was two more jars but a whole bowlful for tomorrow's Wolferman's English Muffin! 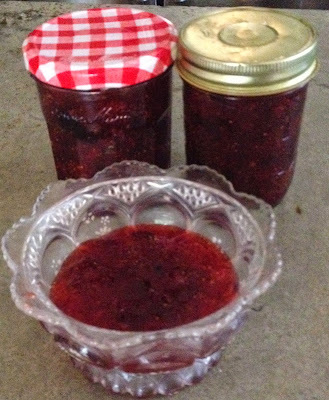 And it makes great jam that tastes of May strawberries. Which we shall enjoy this winter as the snow falls! 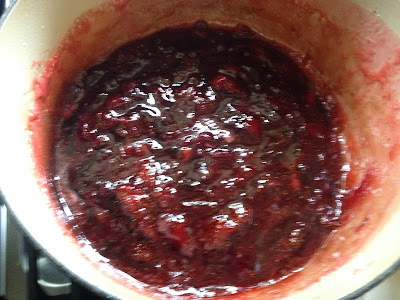 Mix berries and sugar and put into a large pot (I like my Le Creuset Dutch Oven). Stir the mixture very gently with a wooden spoon over low heat until it has "juiced up". Then raise heat to moderate and stop stirring. As soon as it bubbles up, time for 15 minutes and cook without stirring. After 15 minutes remove from heat and allow to cool uncovered. Sprinkle surface when cool with the juice of a half lemon. When cool, stir lightly and put into sterilized jars. Ah, you've developed a real hunger in me for fresh local strawberries! I am once again trying to grow strawberries. My last patch died in the drought. Looking yummy!! !